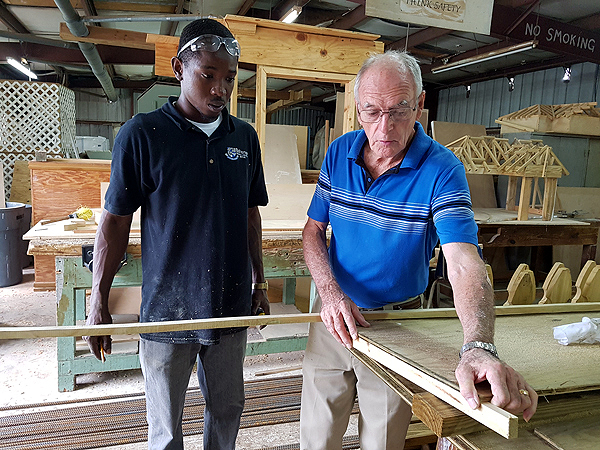 Seven carpentry students of The Bahamas Technical and Vocational Institute (BTVI) are getting a lesson in giving back to the community. The students are helping to renovate The Bahamas AIDS Foundation’s headquarters on Delancy Street by building shelves and hanging racks for the store room, which houses clothes that are donated. They are also replacing the property’s wooden fence. Materials for the three-week project were purchased by the Rotary Club of East Nassau. Head of BTVI’s carpentry department, Graham Thornley, is a member of that club and approached his Tech Prep Carpentry students to join the club in the community service project. President of the Foundation, Lady Camille Barnett, expressed gratitude for the support of the Rotary Club of East Nassau and BTVI. “The volunteer work being provided by the students at BTVI ensures that The Bahamas AIDS Foundation can more efficiently offer the services of our clothing bank in a user-friendly and comfortable space,” said Lady Barnett. “The clothing bank is often utilized by young people who need suitable outfits for job interviews, so it is especially wonderful that young people from BTVI are engaged in a project that will be beneficial to other young people,” she added. 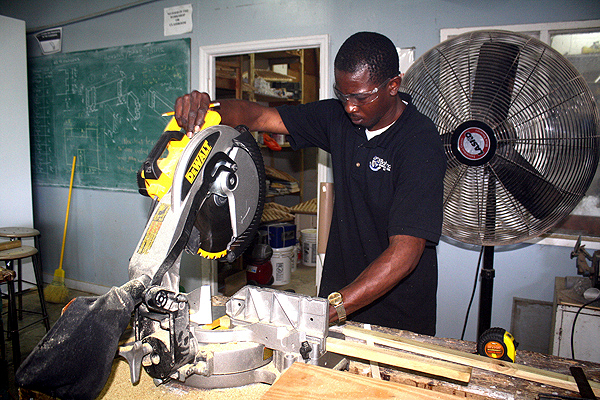 The BTVI team of five males and two female students are utilizing the carpentry skills learned this first semester. “They are using the table saws, crosscut saw, power tools and getting to know the different type of lumber. They are also using joining and fastening techniques, and practicing their measuring,” said Mr. Thornley. “They are learning that service is necessary in our society, where some people don’t seem to care about each other. You don’t always have to give back monetarily. You can give of your time and skills,” he stated. BTVI Carpentry student, Andrew Davis, cutting wood for the class’ volunteer project with the Rotary Club of East Nassau, that will assist the AIDS Foundation of The Bahamas. Carpentry student, Andrew Davis, expressed his delight at being a part of the project, which he feels underscores the importance of community involvement. “I am excited. I am happy to be building something to support those affected by AIDS and their families. It’s a good feeling to lend a helping hand,” said the 27-year-old, who is studying carpentry part-time. 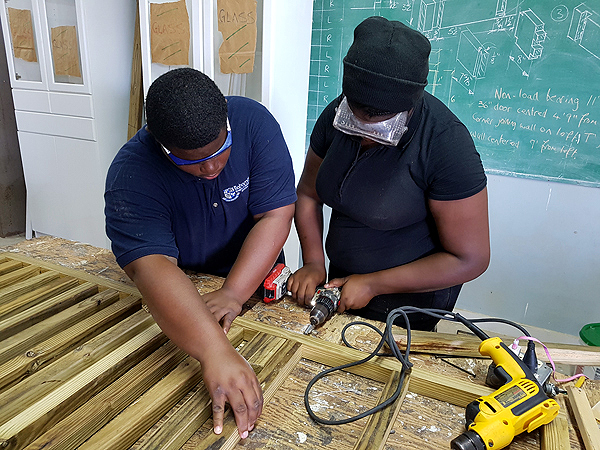 R. M. Bailey seniors, Ramon Sweeting (l) and Randesha Armbrister, who are a part of BTVI’s dual enrollment program, collaborate on a wooden fence to replace the present one at the AIDS Foundation, Delancy Street. Another student, Randesha Armbrister, noted that being a part of BTVI’s dual enrollment program is shaping up to be more than she expected. The R. M. Bailey senior has attended BTVI each Thursday and Friday between 8 am and 3 pm for 15 weeks. She was among the 103 students from Anatol Rodgers, C. V. Bethel, Telios and R. M. Bailey enrolled this semester. “I wanted to be a chef, but carpentry is so interesting,” she said, while working on wood with an electrical drill. “This project makes me feel I am doing good to those who are in need. I never thought I’d come here and be able to help in such a way,” said Randesha. BTVI’s President Dr. Robert W. Robertson noted that reaching out to the community is a key goal of the institution. “It is crucial that we develop partnerships with our community organizations and that as an institution, we are socially responsible,” he said.